Jan. 31, 2017 | 10:35 a.m. While it may not seem readily apparent, farms are about to engage warp drive and rapidly approach light speed when it comes to how they operate. Emerging tools, new technologies and a changing workforce are driving changes across the landscape — developments that can benefit the agriculture industry in Wisconsin and across the world. Technology changes that have expanded computing capability are also helping decrease the costs of doing business. Consider Moore's Law, which describes roughly how computing power has doubled approximately every 12 to 18 months over the last five decades. Five emerging trends have the power to transform Wisconsin agriculture in coming years, and increasing computer capabilities plays a role in four: big data, artificial intelligence, autonomous vehicles and the sharing economy. The other trend is the changing and growing role of women in agriculture and food systems, a demographic shift that started around the turn of the century. A virtual tsunami of data is cresting in the agricultural economy. New data collection devices are constantly being developed, adding to the growing science and business developing around big data, data science and data mining. Often referred to as the Internet of Things, ubiquitous sensor systems collect data from many sources. Examples include perhaps a tractor connected to an online mapping system, an air filter with an Internet protocol address that can communicate with its manufacturer to order a replacement without any human involvement, and devices placed among crops to measure sunlight levels, heat units and pest pressures. 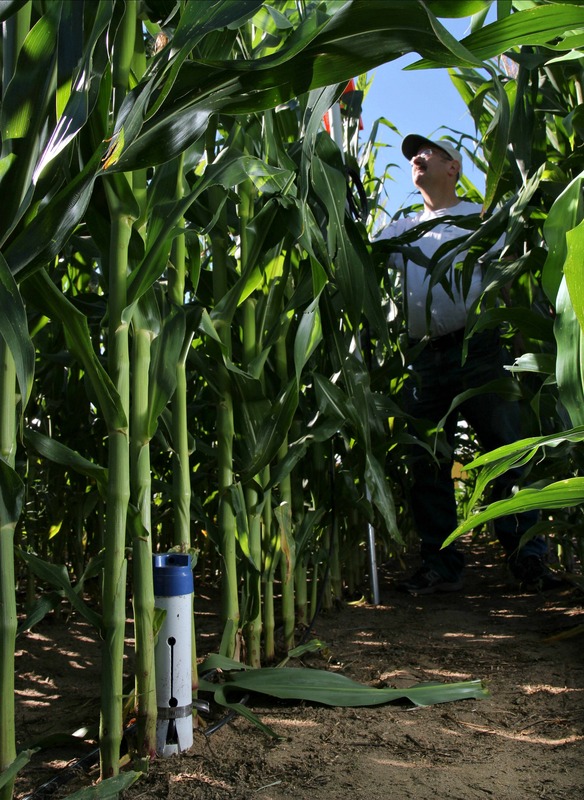 Moisture precision sensors in a cornfield are used to assure that the crops are receiving the right amount of water and nutrients. With the growth of data collection and computing capabilities, Wisconsin must find faster, more affordable and more reliable solutions to broadband, high speed Internet and mobile coverage. The collection of these massive amounts of data necessitates new ways of using this information to drive development of artificial intelligence systems, which can process information and use it to make critical decisions. The health-care industry offers examples and lessons. IBM is investing in its AI computer system, Watson, and partnering with several hospitals and research centers to help improve cancer treatment. Medical researchers publish more than 700,000 cancer treatment-related articles every year in scientific journals. While the average oncology or cancer specialist might read a couple of hundred articles a year, no one person can assimilate and put all this new information to use. But Watson can read, process, sort and identify patterns in those 700,000 articles in minutes. Give Watson a day, and a computer that's the size of five pizza boxes has assembled more knowledge and analysis on treating cancer than ever existed previously. Several examples are now emerging of artificial intelligence successfully suggesting treatment protocols or combinations of medication, precision surgery, pinpointed radiation, and other cellular and molecular therapies. Early agricultural applications might include managing pests, scheduling operations, optimizing animal health or establishing crop health treatments and regimes. However, universities must have the faculty and research capacity to inform, develop and build AI systems in part to ensure the interests of society, public health and consumers are prioritized versus other more commercial, proprietary interests. Autonomous vehicles — including cars, trucks, tractors and UAVs — are an approaching reality. These familiar yet quite novel machines have the potential to profoundly transform not only how people get from here to there, but also how companies distribute products and farmers grow their crops. With development and marketing well underway, the biggest hurdle to their coming ubiquity will not be technological limitations, but rather government regulation and insurance considerations. All the major auto manufacturers are running large-scale highway trials of autonomous cars. Right now, most functional questions center on safety. At some point, though, and perhaps sooner than expected, things will shift, and safety will become the main selling point and reason to move ahead. On the farm, self-driving tractors will free up the farmer's time for other chores. Aerial drones that monitor crops will provide more detailed, timely and accurate information that can boost farm profits. The rapid emergence of economic relationships structured around sharing and collaboration is a trend that will continue to influence agriculture, which has been at the forefront of the cooperative business model for more than 100 years. In a manner similar to the Airbnb model of renting short-term lodging in residential properties, farmers and others in agribusiness will be able to collaborate and share portable or otherwise flexible assets. For example, software platforms that manage sharing transactions through maintaining data about trust and relationships can offset the cost of equipment, such as a $500,000 combine that only gets used 5 or 6 percent of the time in a given year. Apps and other software also could facilitate cooperative transactions involving processing equipment and storage facilities. Women play a major role in agriculture, and more are getting involved, whether as farmers or as veterinarians, scientists, economists, or owners of food processing businesses. The U.S. Department of Agriculture's 2012 Census of Agriculture showed that women make up 30 percent of the nation's principal farm operators (the person primarily responsible for the day-to-day farm tasks) or second or third operators. The crops and livestock produced by the 288,264 farms with women as principal operators accounted for almost $13 billion in market value in 2012. Globally, by 2045 or 2050, farmers will need to feed 9 billion people A huge share of population growth will be in regions that currently face hunger and food supply instability. However, those regions have great potential for growth in food production. The U.S. policymakers, other nations and international organizations see women as having a key role in reducing hunger and focus on empowering them as resource stewards and agricultural decision makers, especially in countries that have the capacity to improve their agriculture to meet need. One big priority is to recognize and purposely support the role women play in agriculture. Women perform 43 percent of the agricultural work in developing nations, yet, in many areas, they lack equal access to capital, machines and other technologies. In a developing country in Africa, Central America or parts of Asia, women farmers are often able to generate up to a 30 percent greater return on investment with the same resources as men. Several business studies point to this same phenomenon in the U.S. Overall, companies in the top quarter of the Fortune 500 with participation by women on corporate boards of directors generate 42 percent greater return on sales and 53 percent greater return on equity than those that don't include their investment. In Wisconsin, more women as enrolling in and graduating from programs in agricultural sciences at University of Wisconsin campuses in Madison, River Falls and Platteville. The Association of Women in Agriculture at UW-Madison is a well-organized and forward-looking student group, and women in the state are active in the nationally oriented Dairy Girl Network. Agriculture is increasingly a relationship business that requires collaboration to create opportunities. These five trends are not emerging in isolation. Each is connected to and feeding upon the others, through the growing power of computers, but also through how that resource changes how people work together and participate in the greater economy. The nature of agricultural jobs themselves will transform, and these changes will require educators and policymakers to prepare for how they'll change the ways people work to feed the world. John Shutske is a University of Wisconsin-Extension specialist and a UW-Madison professor in biological systems engineering, specializing in agricultural system design, safety engineering and agricultural health.